The Indian pitta (Pitta brachyura) belongs to the family Pittidae. The Indian pitta species is distributed in India, Pakistan, Nepal, Bangladesh and Sri Lanka. This pitta species has a distinctive two note whistling call. These pittas are monotypic species. The Indian pitta is a small secretive bird, measuring 17 to 19 cm in length and weighing 45 to 65 grams. The adult Indian pitta has a buff colored cap from the forehead to hind crown. A black central stripe runs along the head meeting the white supercilium at the nape. There is a thick black eye stripe from lores to nape with a conspicuous white line beneath. The chin and throat are white. The upperparts and wings are shades of green. The uppertail is blue. Adults have a large pale greenish-blue glossy patch on the side of the folded wings. The underparts are bright yellowish buff and the lower belly, vent and undertail are bright red in adults. The tail is short and stubby. Both the sexes have similar plumage and the juveniles are duller. The bill of these Indian pitta species is dark gray. The irises are blackish. The eye-ring is gray. There is a thin white stripe just below the eye. The legs are long and strong and pale pinkish gray in color. Their call is a loud two-note whistle "wheeet-tieu" or "wieet-pyou" or a triple note "hh-wit-wiyu" sound. When calling they have been observed to throw back the head and point the bill upwards. The Indian pitta species are distributed in India, Pakistan, Bangladesh, Nepal and Sri Lanka. Breeding populations of Indian pitta are found in the Indian states of Jammu and Kashmir, Himachal Pradesh, Punjab, Haryana, Uttarakhand, Uttar Pradesh, Bihar, Jharkhand, West Bengal, Odisha, Chhattisgarh, Madhya Pradesh, Gujarat, Maharashtra and Andhra Pradesh. The wintering populations are distributed in the Indian states of Goa, Karnataka, Tamil Nadu and Kerala and also Sri Lanka. Passage birds have been recorded throughout the subcontinent. A vagrant had been recorded in Khuzestan province, in southwestern Iran. 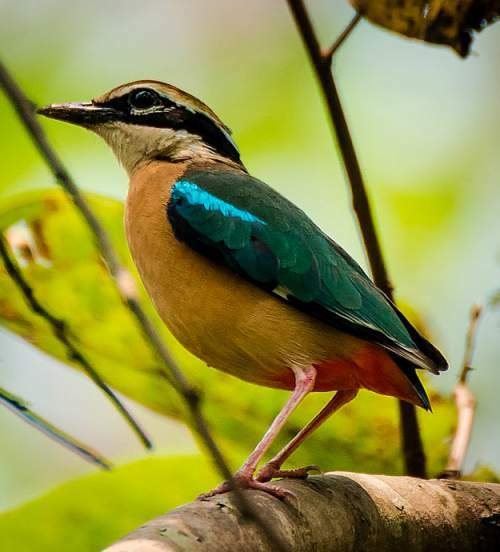 These Indian pitta species have moderate forest dependence. They normally occur in altitudes from 0 to 1800 meters. The artificial ecosystems and habitats of these species include rural gardens, urban parks and plantations. The natural ecosystems and habitats of these species include tropical and subtropical moist montane forests, evergreen forests, moist shrublands with dense undergrowth, tropical and subtropical moist lowland forests, deciduous forests and wetlands. The diet of Indian pitta consists mainly of small invertebrates. Insects, insect larvae, ants, termites, beetles, spiders, cicadas and crickets, earthworms, small snails and millipedes are their primary food. These species occasionally eat food scraps from the ground in rural areas. These Indian pitta species forage on the forest floor and under dense undergrowth. They scratch and scrape the leaf litter for insect prey and also hop about and pick insects on the forest floor. The breeding season of the Indian pitta species is from April and September with a peak in May to August. In Pakistan, the breeding season is mainly during July and August. These birds are monogamous. Though the Indian pittas roost in trees, they mostly nest on the ground or on low branches of shrubs. Their nest is a globular structure made up of dry leaves and grasses. The nest has a circular opening on one side. The clutch is four to five glossy white, spherical eggs. The eggs have deep brown and maroon spots and speckles. Both the parents take turns to incubate the eggs. The chicks hatch out in 16-17 days. The hatchlings are altricial and nidicolous, born helpless, blind and without feathers, simply unable to fend for themselves. The parents brood and feed the young and protect them from predators. These Indian pitta species are mostly migratory birds. The breeding populations are found in tropical and subtropical submontane forests and scrub jungles along the foothills of Himalayas, northeast Pakistan, gangetic plains, central and west Indian hills. These Indian pitta species migrate south to southwest of Indian peninsula and Sri Lanka during October and November for wintering. They return to the breeding grounds in the early summer. Passage birds are found throughout the subcontinent. 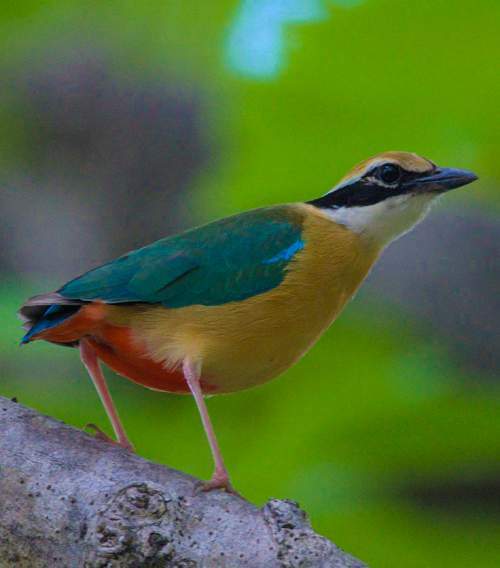 The global population size of the Indian pitta (Pitta brachyura) has not been quantified. The overall population trend of these species is considered to be decreasing. Throughout its range, this Indian pitta species is reported to be fairly common to scarce. The generation length is 4.2 years. Its distribution size is about 2,200,000 sq.km. Habitat alteration and destruction, deforestation and hunting the migrating birds are the main threats that may endanger the survival of these species. The Indian pitta (Pitta brachyura) does not approach the thresholds for being Vulnerable either under the range size criterion, or under the population trend criterion or under the population size criterion. The CITES (Convention on International Trade in Endangered Species of Wild Fauna and Flora) status is ‘Not Evaluated’ for Indian pitta (Pitta brachyura). The P. brachyura species are closely related to fairy pitta (P. nympha) and elegant pitta (P. elegans). It was earlier treated as conspecific with P. nympha and sometimes also with P. elegans. Current topic: Indian pitta - Pitta brachyura.